Makybe Diva's first foal Rockstardom will make his city debut at Caulfield on Saturday. Trainer Danny O'Brien confirmed on Monday the Galileo three-year-old, who cost $1.5 million as a yearling, was ready for the Listed Galilee Series Final at Caulfield over 2406 metres after five improving runs on provincial tracks. 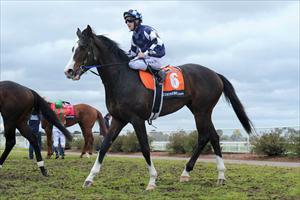 "He is certainly going to be best suited getting to 2400 metres at Caulfield on Saturday," O'Brien said. Rockstardom is still a maiden but hasn't finished further back than fifth at any of his five runs in two campaigns. This preparation has been more promising with an eye-catching second-up third when beaten 1-3/4 lengths by Testimony in a 1600m race at Ballarat on March 10 and a fast-finishing 1-1/4 length third to Blistered over 2025 metres at Cranbourne on March 27. Rockstardom has much to live up to as the son of three-time Melbourne Cup winner Makybe Diva but O'Brien has been patient with the impressive looking colt. He has always maintained he would need time and distance to find his best form. "You can't expect too much from a horse like him until he does get to 2400 metres," O'Brien said. "He found the line strongly in a 2025-metre maiden around Cranbourne, which was probably not the ideal track for him, and we are expecting him to run well on Saturday. "It's the right distance for him at this stage of his career." Tony Santic who owns three-time Makybe Diva has retained an interest in Rockstardom. The Galilee has attracted 17 nominations including the in-form Mick Price-trained Cuban Sunday who is the benchmark runner in the race. A winner of three of his past three starts, Cuban Sunday has posted a win and a dead-heat in two of the series heats. Peter Moody-trained Almodovar who dead-heated with Cuban Sunday in the Rokk Ebony Cup (2000m) on March 26 again looks a danger and the stable has also entered third-placed Elusive King.